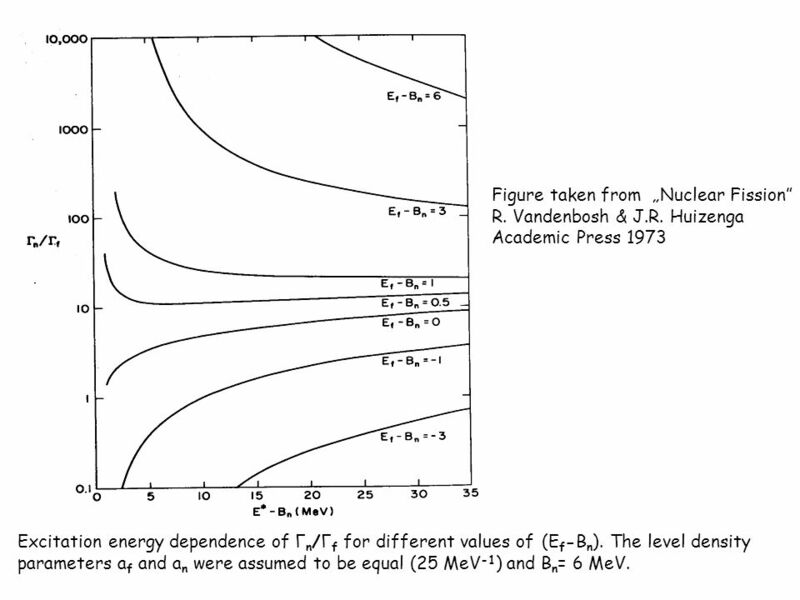 70 YEARS OF FISSION Kazimierz 2008 Comment on a frequent error in calculations of the n / f ratio W.J. Świątecki, J. Wilczyński and K. S-W.
2 1. G. G. Adamian, N. V. Antonenko, and W. Scheid, Nucl. Phys. A678, 24 (2000) 2. 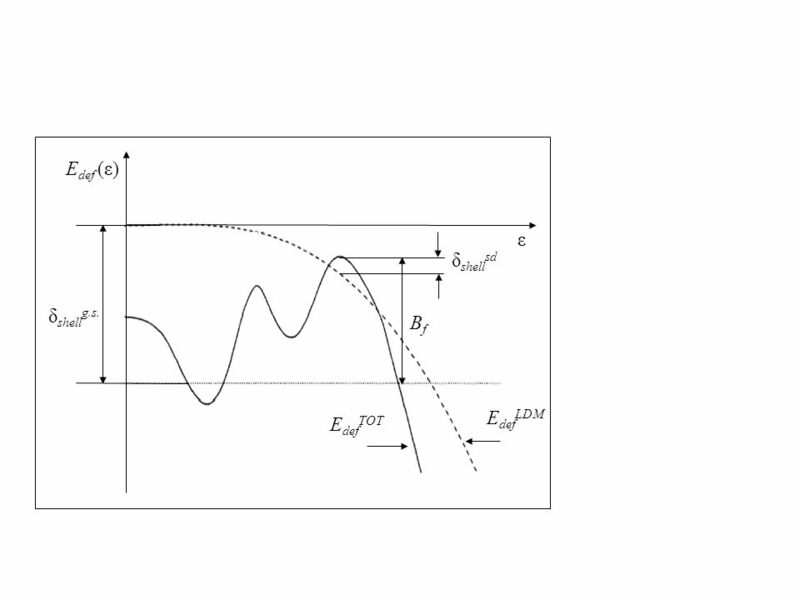 A. S. Zubov, G. G. Adamian, N. V. Antonenko, S. Ivanova, and W.Scheid, Phys. Rev. C 68, 014616 (2003). 3. G. G. Adamian, N. V. Antonenko, S.P. 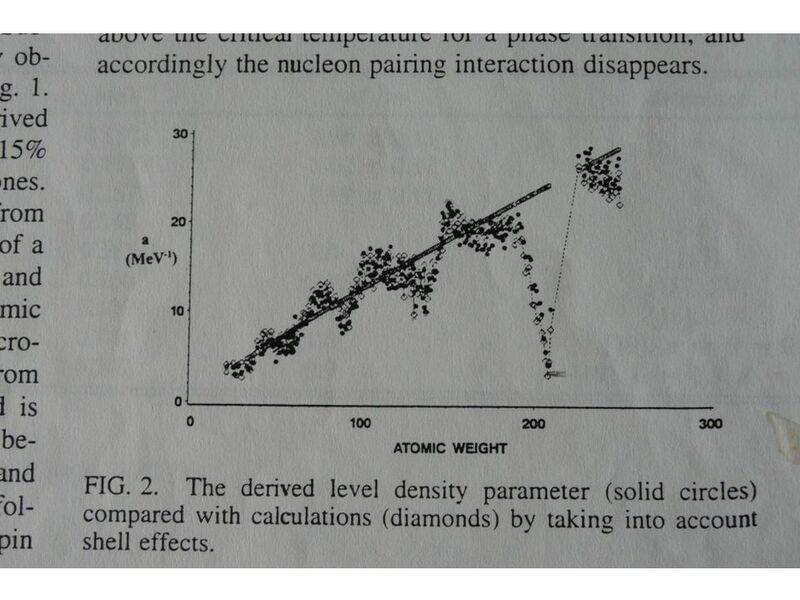 Ivanova, and W. Scheid, Phys. Rev. C 62, 064303 (2000). 4. 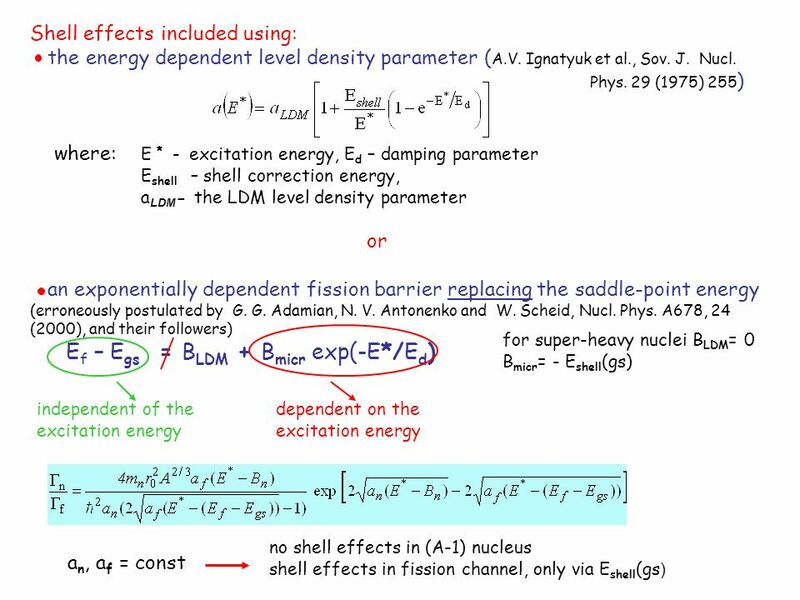 A. S. Zubov, G. G. Adamian, N. Antonenko, S. Ivanova, and W. Scheid, Phys. Rev. C 65, 024308 (2002). 5. G. G. Adamian, N. V. Antonenko, and W. Scheid, Phys. Rev. C 69, 011601 (2004) 6. G. G. Adamian, N. V. Antonenko, and W. Scheid, Phys. Rev. C 69, 014607 (2004) 7. G. G. Adamian, N. V. Antonenko, and W. Scheid, Phys. Rev. C 69, 044601 (2004). 8. Z.-Q. Feng, G.-M. Jin, J.-Q. Li, and W. Scheid, Phys. Rev. C 76, 044606 (2007). 9. Z.-Q. Feng, G.-M. Jin, F. Fu, and J.-Q. Li, Nucl. Phys. A771, 50 (2006). 10. 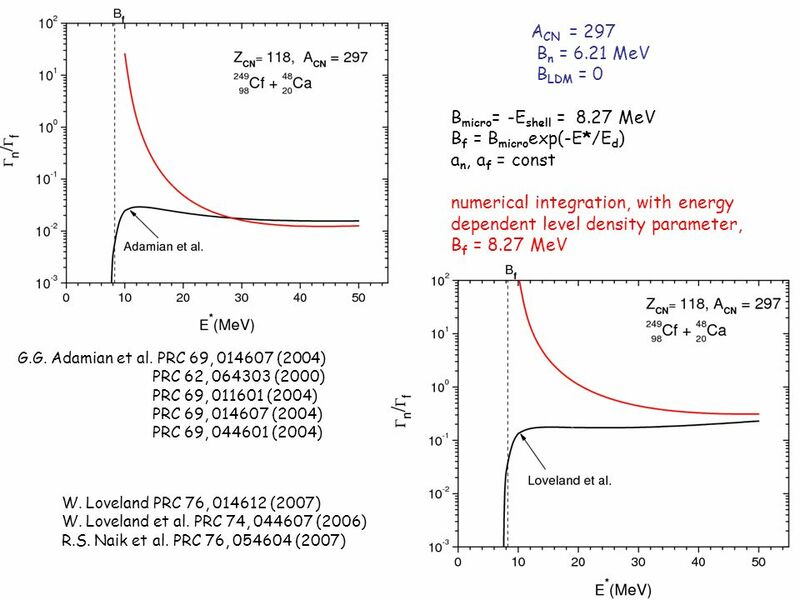 Z. H. Liu and Jing-Dong Bao, Phys. Rev. C 76, 034604 (2007). 11. V. I. Zagrebaev, Phys. Rev. C 64, 034606 (2001). 12. Yu. Ts. 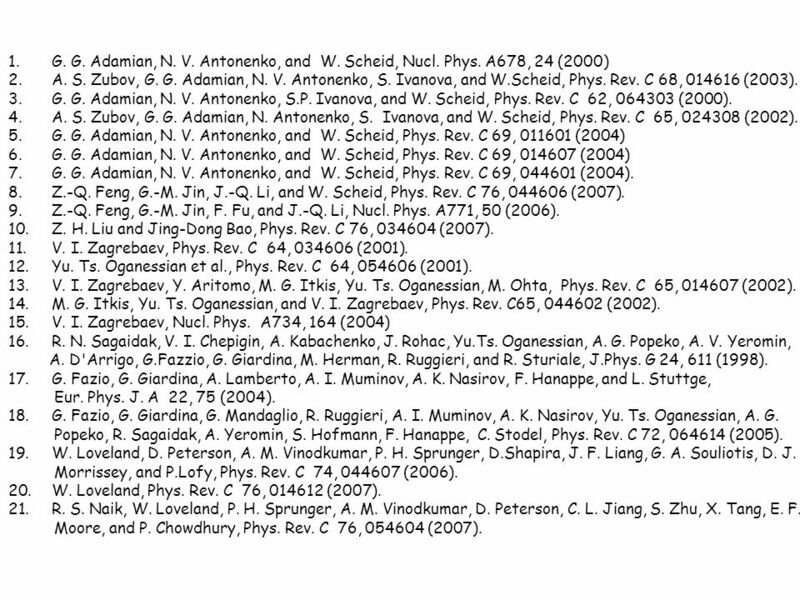 Oganessian et al., Phys. Rev. C 64, 054606 (2001). 13. V. I. Zagrebaev, Y. Aritomo, M. G. Itkis, Yu. Ts. Oganessian, M. Ohta, Phys. Rev. C 65, 014607 (2002). 14. M. G. Itkis, Yu. Ts. Oganessian, and V. I. Zagrebaev, Phys. Rev. C65, 044602 (2002). 15. V. I. Zagrebaev, Nucl. Phys. A734, 164 (2004) 16. R. N. Sagaidak, V. I. Chepigin, A. Kabachenko, J. Rohac, Yu.Ts. Oganessian, A. G. Popeko, A. V. Yeromin, A. D'Arrigo, G.Fazzio, G. Giardina, M. Herman, R. Ruggieri, and R. Sturiale, J.Phys. G 24, 611 (1998). 17. G. Fazio, G. Giardina, A. Lamberto, A. I. Muminov, A. K. Nasirov, F. Hanappe, and L. Stuttge, Eur. Phys. J. A 22, 75 (2004). 18. G. Fazio, G. Giardina, G. Mandaglio, R. Ruggieri, A. I. Muminov, A. K. Nasirov, Yu. Ts. Oganessian, A. G. Popeko, R. Sagaidak, A. Yeromin, S. Hofmann, F. Hanappe, C. Stodel, Phys. Rev. C 72, 064614 (2005). 19. W. Loveland, D. Peterson, A. M. Vinodkumar, P. H. Sprunger, D.Shapira, J. F. Liang, G. A. Souliotis, D. J. Morrissey, and P.Lofy, Phys. Rev. C 74, 044607 (2006). 20. W. Loveland, Phys. Rev. C 76, 014612 (2007). 21. R. S. Naik, W. Loveland, P. H. Sprunger, A. M. Vinodkumar, D. Peterson, C. L. Jiang, S. Zhu, X. Tang, E. F. Moore, and P. Chowdhury, Phys. Rev. C 76, 054604 (2007). 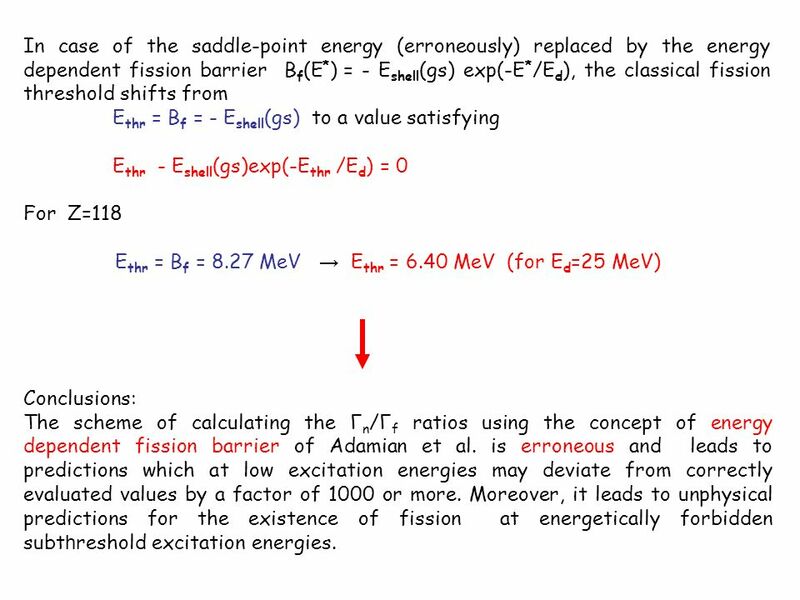 9 In case of the saddle-point energy (erroneously) replaced by the energy dependent fission barrier B f (E * ) = - E shell (gs) exp(-E * /E d ), the classical fission threshold shifts from E thr = B f = - E shell (gs) to a value satisfying E thr - E shell (gs)exp(-E thr /E d ) = 0 For Z=118 E thr = B f = 8.27 MeV E thr = 6.40 MeV (for E d =25 MeV) Conclusions: The scheme of calculating the Γ n /Γ f ratios using the concept of energy dependent fission barrier of Adamian et al. 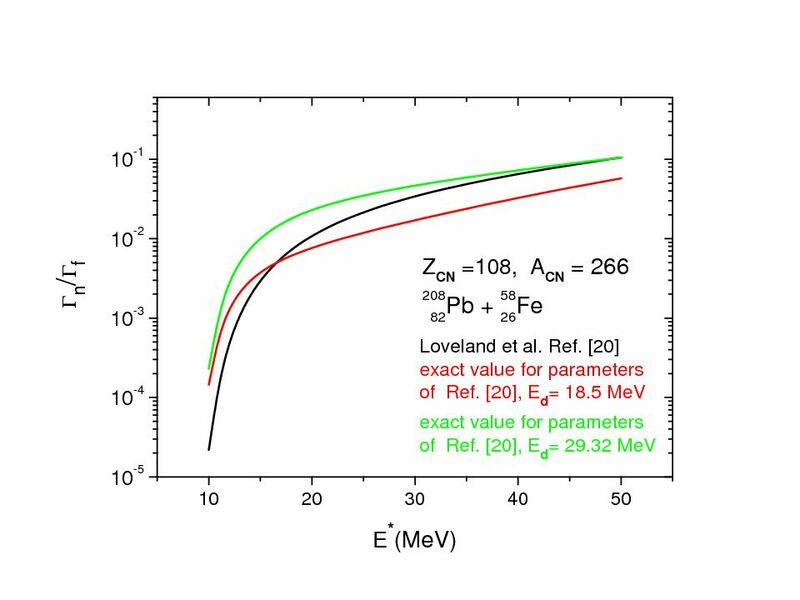 is erroneous and leads to predictions which at low excitation energies may deviate from correctly evaluated values by a factor of 1000 or more. 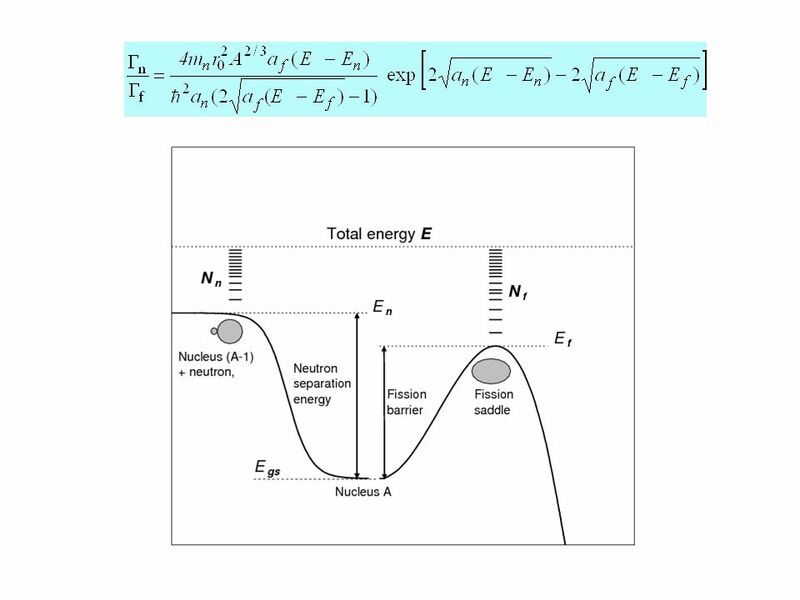 Moreover, it leads to unphysical predictions for the existence of fission at energetically forbidden subt h reshold excitation energies. 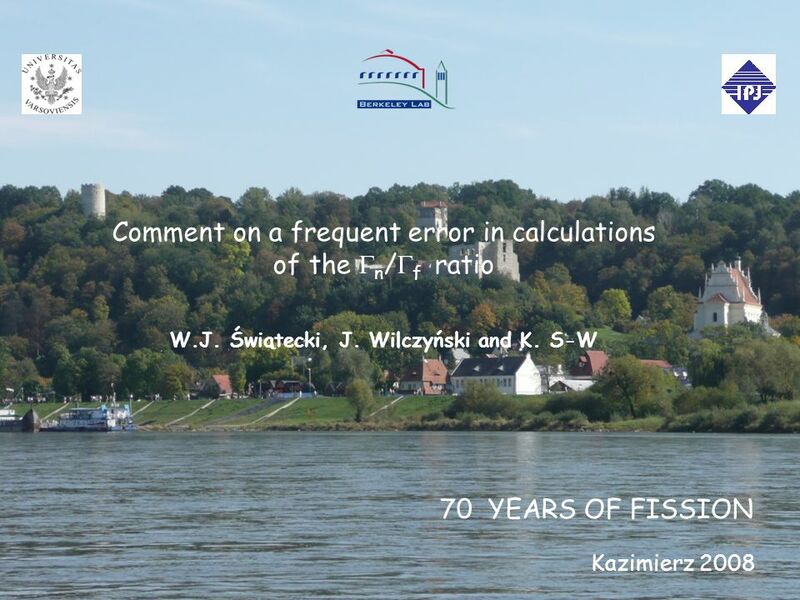 Download ppt "70 YEARS OF FISSION Kazimierz 2008 Comment on a frequent error in calculations of the n / f ratio W.J. 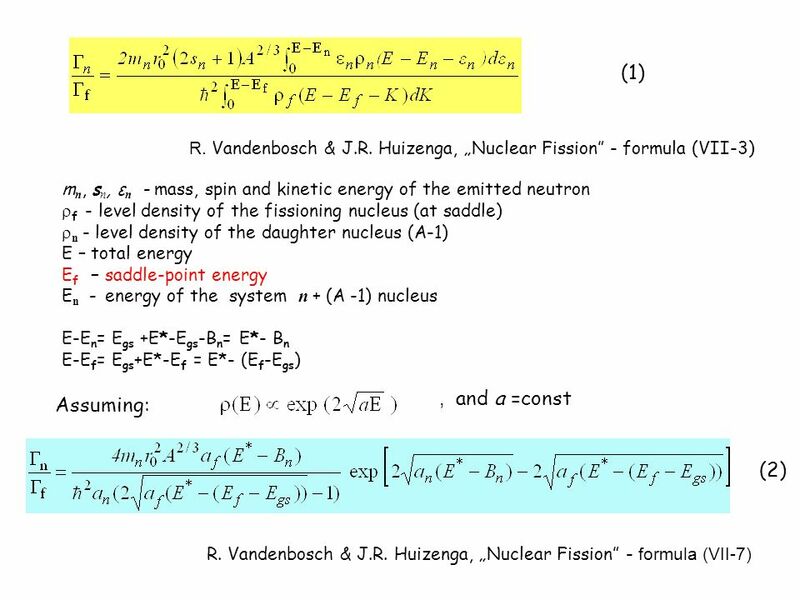 Świątecki, J. Wilczyński and K. S-W."
Systematic study of fusion reactions leading to super-heavy nuclei Ning Wang ( ) Guangxi Normal University Workshop on Synthesis. 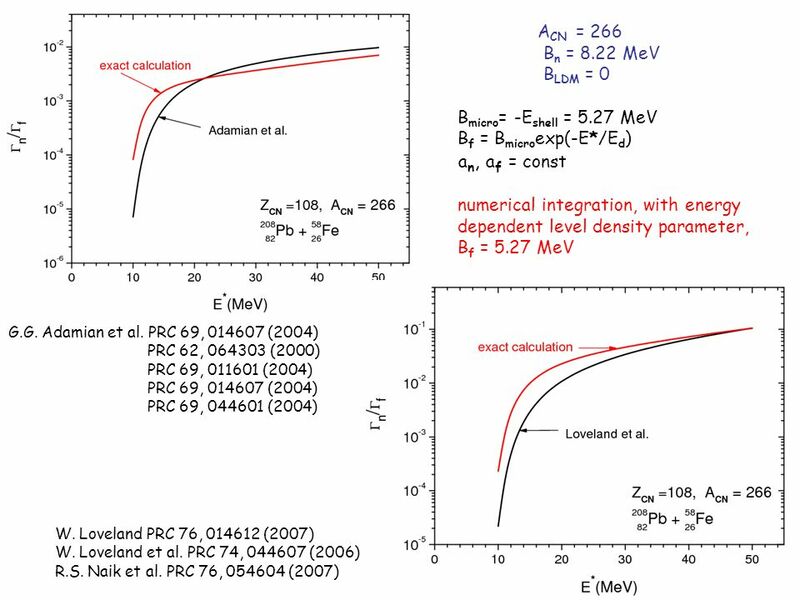 Systematics of fusion probability in reactions leading to super-heavy nuclei Ning Wang ( ) Guangxi Normal University Dec., Beijing. 1 Workshop Espace de Structure Nucléaire Théorique / April, 2010 Olivier SEROT Commissariat à lEnergie Atomique – Centre de Cadarache Direction pour. 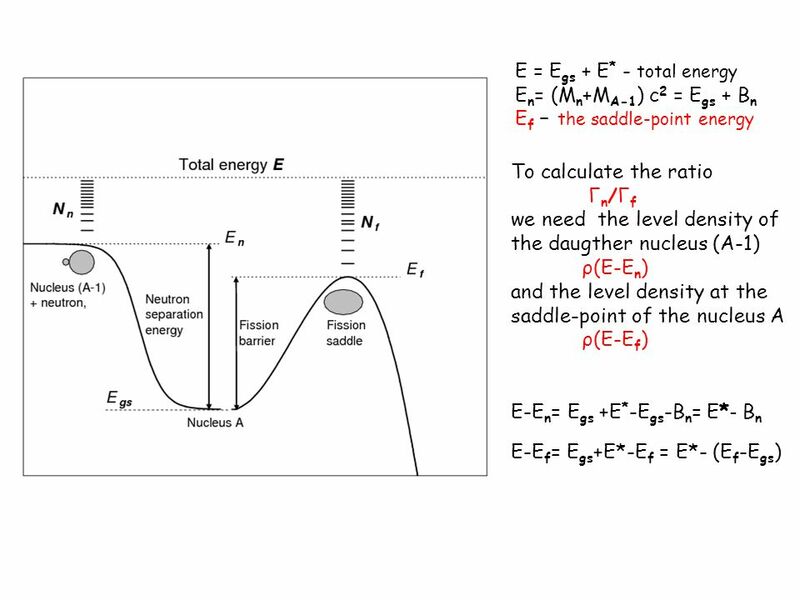 Slide 1Fig. 17.1, p.513 Active Figure Slide 2Table 17.1, p.514.